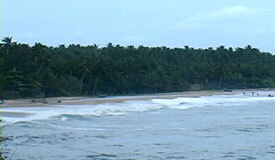 The sandy beach Kappad is one of the famous beaches of Kerala, due its historical background and charming beauty. Locally known as Kappakadavu, it is located just 16 km from Kozhikode town. The historic past is that Vasco da Gama (1460-1524), the Portuguese voyager landed on this Beach on 27th May 1498 with 170 men in three vessels which later on turned the Indian history upside down. This historic event is commemorated by a little stone monument on the beach with an inscription 'Vasco da Gama landed here, Kappakadavu, in the year 1498'. A distinctive feature of this beach is the moss covered rock that protrudes into the sea. On the rocks nearby is a temple believed to be 800 years old, facing the deep sea. This provides an excellent landscape. The view of the sunset is also a worth seeing. The beach, strewn with country fishing boats is ideal for relaxation. The beach here offers opportunities for sand castle building and other beach activities. During high tide, the beach is only 30 meters away from the sea, while on low tide, this increases to around 80 meters so take local advice before entering the sea. Kappad finds mention in history and geography texts as the gateway to the Malabar coast. Getting food is not problem at all at this beach. There are a lot of places at Kappad with good places to eat and drink.